The first thing I notice is Mirto. An inviting container loaded with a thick and full gelato, blue like the sky. Even though it’s something I’ve never tried, and I have nothing to compare it to, I am confident it’s going to be great. 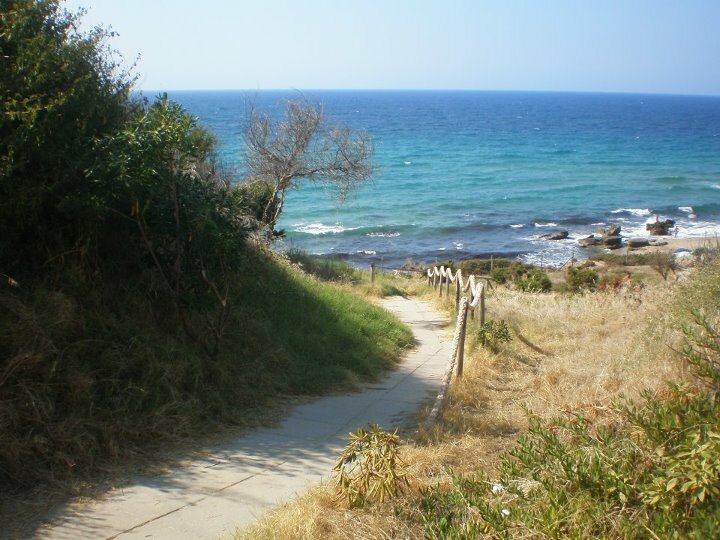 To make this flavor, Nicola Piana, owner of the ice cream parlor ‘La Gelateria’, in the cute beach town of Valledoria, north of Sardinia, picks up mirto berries in the fields and grinds them in a fior di latte base. The key ingredient is a round, tiny and dark blue berry, derives from myrtle, a flowering plant that grows freely in the Mediterranean area. Grainy and pungent, it almost tastes like a blueberry, but with a hint of herb. 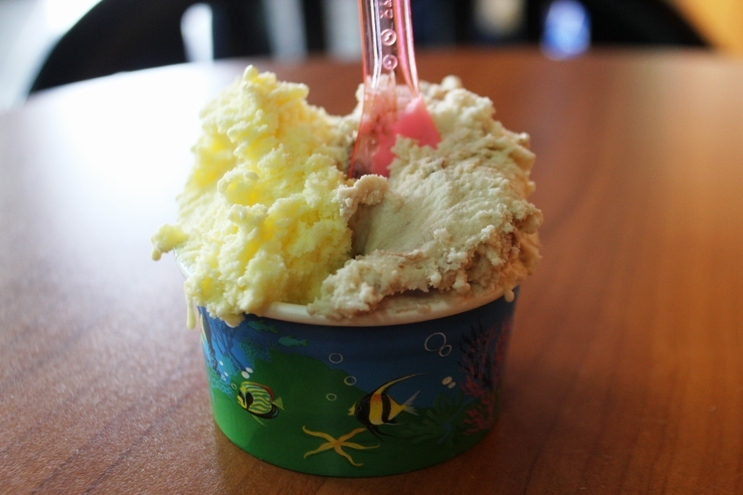 It’s no surprise that the resulting gelato is superb. In each bite, microscopic bristles of seeds, make you feel like you’re eating a sweet, delicious berry from the earth. Nicola is new on the scene. 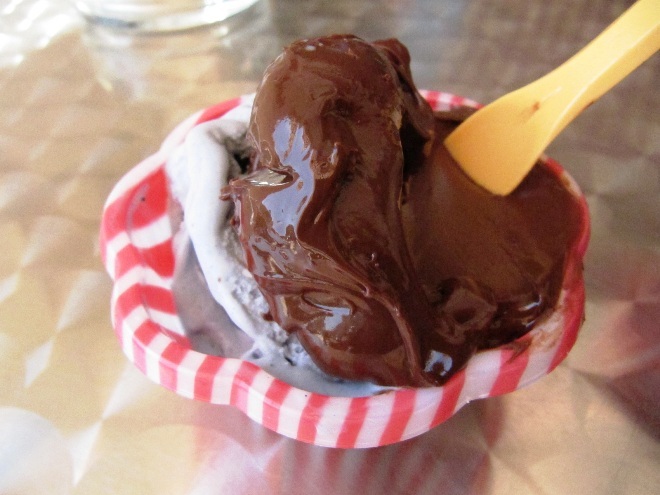 He learned to make gelato a little more than a year ago, taking classes in Olbia, Milan, Bologna and Rimini. His passion for ice cream though is something he developed a long time ago. 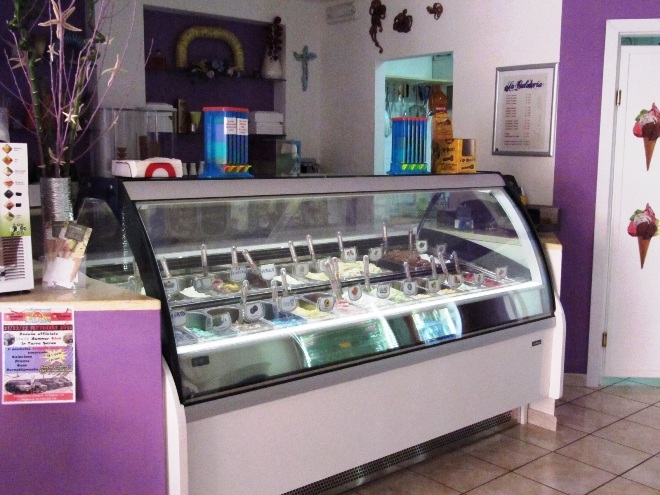 Piana worked as a bar man for 26 years, and even if he didn’t get to make the gelato, he used to serve it every day. Eventually, the urge was so strong that he opened his own shop. “It’s something that burns inside of you. And now seeing my customers and all the inhabitants of Valledoria smiling when they eat my gelato pays me back for all my efforts”. 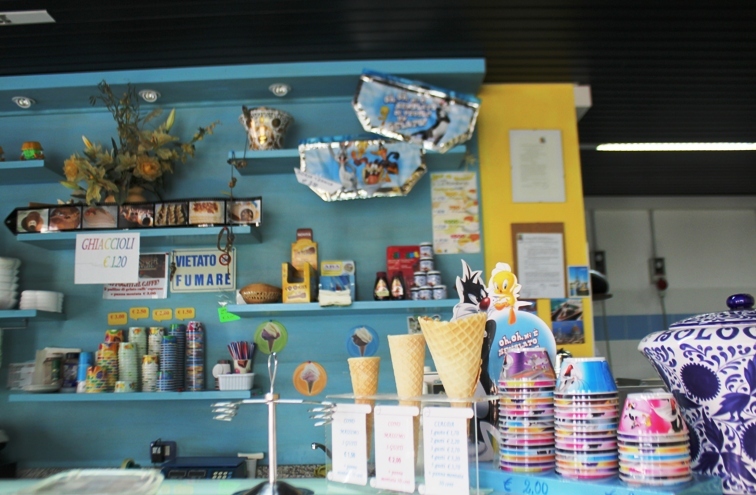 His passion for this typical Italian dessert is evident in many different details: he compulsively cleans the tables every 5 minutes, the gelato containers are constantly kept in order and the ice cream is artfully shaped. “The experience begins with your eyes,” he reminds me, “and, besides looking inviting, gelato has to be creamy, spreadable. It needs to be constantly worked, moved in order not to freeze and maintain its delightful thick-like-butter texture”. To demonstrate, Nicola picks up a scoop of creme brûlée gelato and flips it upside down; the cream firmly sticks to the spoon. 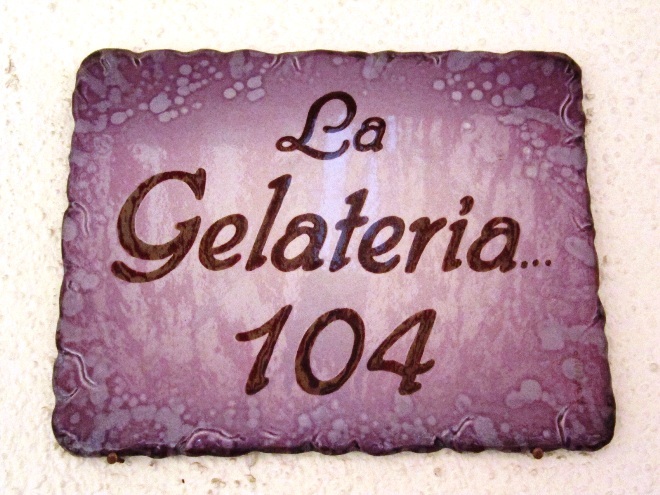 What really proves the results of his commitments is the signature flavor ‘La Gelateria’, a mixed creme base richly infused with pieces of nuts and spectacularly covered with balls of macaroons atop. Furthermore, Cookies flavor here is different from any other one I tried. This excellent chocolate base, with its orange flavored caramel glaze and biscotti bristles, is as unique as it sounds. Nutella though is what really astonishes me. Its exceptional richness earns the title of the best Nutella I’ve ever had. While I savor it, it’s as if I’m scooping the spread out of the vase. It’s thick. Extremely thick. So thick that I doubt this is ice cream. Nicola assures me: “It’s all real, all gelato. Just an extremely high concentration of hazelnuts and chocolate.” The treat is almost too intense to be eaten plain. Nicola suggests me to pair it with his Banana, an extremely particular sorbet which is flavorful and full-bodied. Its consistency resembles cotton candy: stringy when pulled from the cone to my mouth. Combined with the Nutella, it’s heaven. I ask Nicola how he creates the consistency. “It’s just water and fresh fruit,” he replies. I know better: “That’s impossible!” “Well,” he admits, “it’s a secret.” I can’t blame him. It’s like nothing I’ve ever tried. When I asked him what his favorite, I’m awed by his reply: “I don’t eat gelato.” It sounds impossible to believe. “How can you know if you make a good product?” “Well, if you’re a sommelier,” he tells me, “you don’t get drunk. It’s the same with gelato: I eat it when I need to make sure it’s perfect and correct all the little defects.” The logic makes sense. And it’s hard to argue when it leads to such a memorable gelato.